Grooveshark’s lengthy legal battle with several of the world’s major recording labels, who accused the popular music streaming service of mass-copyright infringement, may soon come to an end. Several of the company’s (former) employees have agreed to a “consent judgment” which prohibits them from infringing the major labels’ copyrights or working with similar services in future. No settlement has been reached with the parent company yet, but the recent developments cast doubt over Grooveshark’s future. In November 2011, Universal Music Group, the world’s largest recording label, sued music streaming service Grooveshark. 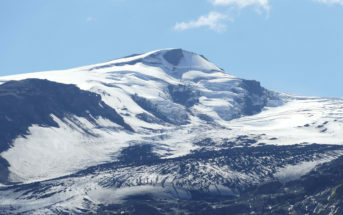 The label claimed hundreds of millions of dollars in damages and accused the company of massive copyright infringement. The accusations included claims that bosses and other workers at the company, from the CEO down, personally uploaded many thousands of infringing tracks to the service. Universal was later joined by Sony, Warner and several other labels who all called for the shutdown of the streaming service and fines against the named employees. In recent months activity in the case slowed down, but behind the scenes the discussions continued. This has now resulted in a voluntary agreement between the labels and five Grooveshark employees. Nikola Arabadjiev is the only one who still works at the company. Grooveshark founder Sam Tarantino and co-founder Josh Greenberg have not signed an agreement. The “consent judgments” obtained by TorrentFreak suggest trouble for Grooveshark, which up until now streamed millions of songs without explicit authorization from copyright holders. Under the agreement the named Grooveshark employees are prohibited from infringing copyrights of musical works owned by the major labels. In addition, they must never again work with a business that systematically infringes upon label copyrights. “The Defendant and all those acting in concert with the Defendant shall be immediately and permanently enjoined from infringing in any manner any copyright in any and all sound recordings, whether now in existence or later created, in which any of the Plaintiffs own or control any exclusive rights under Section 106 of the United States Copyright Act (the “Copyrighted Works”),” the agreement reads. “This shall include, but is not limited to, copying, uploading, reproducing, distributing, transmitting or publicly performing any of the Copyrighted Works in violation of the United States Copyright Act, via the Grooveshark service or any other online streaming service, website, application, or peer-to-peer or file-trading system that operates without authority or license from the appropriate Plaintiff or any of its licensees,” it adds. 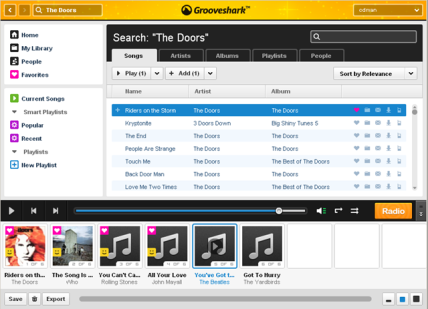 TorrentFreak approached Grooveshark and the record labels for comment on the recent developments. Grooveshark’s attorneys preferred not to comment on the developments and we have yet to hear back from the labels. The current lawsuit is just one of many Grooveshark has been dragged into over recent years. January last year EMI sued the music service over a contractual dispute, and Grooveshark has been blocked following court orders in Germany and Denmark. This week, record labels in the UK indicated that they are preparing an ISP blockade of the site. Over the years Grooveshark has always fiercely defended its business, arguing that it operates within the boundaries of the law and removes unauthorized content when it receives a DMCA takedown notice. At the same time, they negotiated licensing deals with the major labels. “Laws come from Congress. Licenses come from businesses, Grooveshark is completely legal because we comply with the laws passed by Congress, but we are not licensed by every label (yet),” Grooveshark’s Paul Geller said previously. However, it seems that the major labels probably want to quash the site entirely instead of legitimizing it through licensing deals. At the time of writing the music service is still up and running and no settlement with Grooveshark has been entered. However, now that key defendants in the case have struck a deal it would be no surprise if parent company Escape Media follows suit. Grooveshark sent the following statement. We have yet to get a reply on out follow up questions asking what the settlements mean for the future of the site.